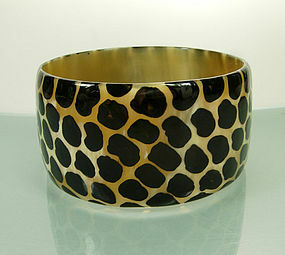 Animal prints are a top trend and this fabulous piece makes a super statement. Painted on carved translucent horn. Probably circa 1990. 1 1/2 inches wide, 1/8 inch thick, and 2 3/4 inches inside diameter (this is slightly larger than the standard 2 1/2 inches). Excellent condition. Photos enlarged to show detail. Display form is life size.